Phenology is an excellent way to teach science, technology, and math standards such as inquiry, observation, creating relevant questions, making predictions, graphing and analyzing information, problem solving, conducting basic research, and communication of results. Adding a phenology monitoring program to your classroom is easy if your project is well planned. Consider involving other like-minded teachers and staff to make it a meaningful, multi-year experience. If you can commit to establishing a site at your school for at least 2 years, take a look at our Nature's Notebook Planning Resources to help you get started. Questions on how to get started? Contact our Education Coordinator. There are many hands-on citizen science programs available for phenology monitoring, and some are perfectly suited for K-4 audiences. Visit our partners’ websites for ideas about how to incorporate phenology education in the classroom. View Nature's Notebook curriculum materials developed for these grade levels in the table below. The purpose of this Nature’s Notebook Sustainability Plan is to provide documentation of your Local Phenology Program that can be shared with stakeholders, coworkers, or volunteers. This can be a valuable document in the event that you and other founding Leaders are no longer able to work on Nature's Notebook for your organization. Designed outcomes, a list of partnering groups, potential funders, and information about the Local Phenology Program in Nature’s Notebook can help ensure the program’s sustainability in the event of staff or volunteer turnover. This resource guide describes how to develop a program plan for monitoring phenology with groups of people. It walks you through the steps to creating a long-term phenology monitoring program for Nature's Notebook, with education, research, management, or all three as an overarching objective. It also includes a checklist on page 13 detailing the succesful elements of a Local Phenology Program designed for sustainability. Includes details about how to draft and write sound program outcome statements, objectives, and developing a logic model. Before you embark on designing any type of long-term phenology monitoring program consider doing a needs assessment to decide what "need" something like a Nature's Notebook might fill. The first link above is a simple needs assessment form which can be used to determine your first steps in program development. You can also share your information with the National Coordinating Office staff by completing the web form linked from that page. Before you dive into writing up a Program Plan for your long-term Nature's Notebook phenology monitoring program, consider using this worksheet to help you think about short, medium, and long-term measurable outcomes. You also may wish to document some of the information you've gathered from your Needs Assessment Form if you've got stakeholders and resources now available to you. If you've decided upon your needs, decided how Nature's Notebook can help you meet those needs and the resources you have available, then you can work backward to determine what specifically you need to do to get you there. We also offer a planning worksheet in Spanish if you are working with Spanish speaking audiences. This worksheet will help you think more specifically about the objectives and action steps you need to do to achieve your stated short, medium, or long-term outcomes for your program. Use this to help you better articulate the Short-, medium-, and long-term outcomes and objectives after working through the Program Planning Activity Worksheet. If you'd like to use a more traditional planning template, check our our Logic Model Worksheet for documenting measurable outcomes. How are you going to get from point A to point B? This template helps you to document the steps you are taking (your objectives and activities) and provides a place to record what resources you need for each, who is responsible for completing activities and tasks, and documentation for when it is complete. We also offer a Sustainability Plan where you may wish to document aspects of your LPP in the event that you leave your position and someone else must take over the Program. The following activity is an introductory lesson in the basics of observation skills for young children. Observation is a crucial component to scientific inquiry as well as many basic life skills. This activity encourages young children to take notice of their surrounding environments and reflect on their observations. This activity was submitted by Lexie Barrell from the Science Museum of Virginia for partial fulfulment of the requirements for the Local Phenology Leader Certification Program in the Spring of 2018. To acclimate people to looking closely at the plants and animals for observation in Nature's Notebook, use this activity outdoors. Print out the letters to the word PHENOPHASE on 8 1/2 by 11 paper, one letter per page. On separate pages create descriptions or definitions that start with each of the letters in the word PHENOPHASE. Use brightly colored paper and laminate the cards for use later. Hide the description cards in the garden or around the site. Retain the letter cards to pass out to the group. Have people work in pairs or in threes. Do not tell them that the word spells PHENOPHASE. Depending upon the letter selected the team has to seek a card with a definition that matches the letter on their card. Once they locate it they should find and identify the item described and have a conversation about how it is related to phenology and the importance of it to the ecosystem. Bring everyone back together to debrief the activity after they've found their cards. Have them arrange themselves such that they are spelling out the word PHENOPHASE. Ask each team to share what they found. 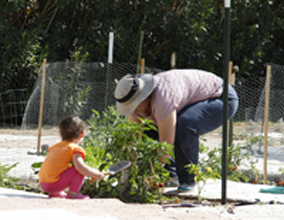 This activity was developed by Michelle Coe from the Community and School Garden Program at the University of Arizona. At the 2017 University of Arizona Insect festival the Nature's Notebook Education team presented several activities having to do with insect phenology. 1. We purchased crickets at a local exotic pet store (and after the event donated them to a critter keeper who feeds crickets to his pets). We created the Insect Amplifier (as shown in example #1a above) and asked the students to count the chirps to determine the ambient temperture (as described on example #1 above). They were asked to record their data on a sheet at the table and as the day got warmer, the chirps became more abundant. We talked about the timing of their chirps, what chirps are used for, and how it is related to the surrounding environment. When during the year do crickets chirp? 3. We used our simple data sheets and students were able to go outside to a marked plant and collect observations using Nature's Notebook. If they returned their data sheet to us with correct answers, they were given a Nature's Notebook pencil. 4. We had a phenology bingo game available for students where they could review the phenological events present on the bingo card and put a stamp next to the ones they had experienced. #3 above includes a sample of the bingo card and the full Phenology Bingo lesson can be found on our website, here. 5. We created a series of What am I cards and used them as a matching game. #4 above includes a sample of two of the cards. On the reverse side is a photo of the plant with the common and scientific name below. Students can either guess what the answer to the question is or use them as a matching game to match the picture to the definition.